We’d love your help. Let us know what’s wrong with this preview of Discovery by Karina Lumbert Fabian. If your mental picture of religious sisters is dour, old women with wimple habits and ankle-length skirts, then scrub that image before opening Discovery. The sisters in the Order of Our Lady of the Rescue are post-modern, brave pioneers with habits suited to work in zero gravity. The challenges to their present mission on the alien craft Discovery are best summed up by Sister Rita's exclamation of "Codists and Wiccans and evangelists, oh, my." Sister Rita, along with stalwart pilot Sister Thomas If your mental picture of religious sisters is dour, old women with wimple habits and ankle-length skirts, then scrub that image before opening Discovery. The sisters in the Order of Our Lady of the Rescue are post-modern, brave pioneers with habits suited to work in zero gravity. The challenges to their present mission on the alien craft Discovery are best summed up by Sister Rita's exclamation of "Codists and Wiccans and evangelists, oh, my." Sister Rita, along with stalwart pilot Sister Thomas and "spacey" but brilliant Sister Ann, have all sorts of conflicting interests to contend with: the brainy researchers, the working-class rockjacks, and, oh yeah, that alien ship. Interwoven amongst the crew's scientific discoveries are their personal discoveries, brought to light within the desolate alien craft. Karina Fabian does a good job of managing what could be an unwieldy cast of characters, two romances, devious intrigue, and a guilty conscience. In the end, the most profound discovery isn't an alien life form, but a relationship with God, whose love knows no boundaries, whose mercy overflows, and who calls us each for a unique purpose. Just enough bread crumbs are dropped to keep the reader intrigued by the various interpersonal relationships and cryptic messages of Sister Ann, mounting to page-turning suspense in the final chapters. Discovery is a journey worth taking. Discovery takes place in the near-future, as humanity is pushing out into the Solar System, has established major habitats in Earth orbit, on the Moon and on Mars, and has begun commercial mining operations in the Asteroid Belt. Zero-gee is a great equalizer for workers in space, where coordination and balance often trump physical strength. So, it’s not so great a stretch to imagine religious communities, including the Catholic Church, would find their niche in the Belt, with both men and women Discovery takes place in the near-future, as humanity is pushing out into the Solar System, has established major habitats in Earth orbit, on the Moon and on Mars, and has begun commercial mining operations in the Asteroid Belt. Zero-gee is a great equalizer for workers in space, where coordination and balance often trump physical strength. So, it’s not so great a stretch to imagine religious communities, including the Catholic Church, would find their niche in the Belt, with both men and women doing the sorts of things those communities have done throughout history. Occupying an important role at the center of this particular story is a society of women religious, the Order of Our Lady of the Rescue, colloquially known as the “Rescue Sisters,” who provide search and rescue services for the miners and transporters working the Belt. There’s an old saying that there are no atheists in foxholes, and I think it’s safe to say that there will also be few who strike out into the void to live and work on the ragged frontiers of interplanetary space. Frontiers have a way of organizing our priorities and revealing our limitations in uncomfortable detail..
3.5 stars because I liked this story. (3 stars here, 4 stars on Amazon) I knew before I started reading that this would be unlike any novel I'd read before, even among science fiction. But come on—nuns in space? Well, technically Catholic sisters because they aren't cloistered in a convent. Ms. Fabian tells a highly creative story that reflects her Catholic faith but offers new and clever elements. And asks questions. So be ready to think. My only complaint regarding the plot is that the alien s 3.5 stars because I liked this story. (3 stars here, 4 stars on Amazon) I knew before I started reading that this would be unlike any novel I'd read before, even among science fiction. But come on—nuns in space? Well, technically Catholic sisters because they aren't cloistered in a convent. My only complaint regarding the plot is that the alien spacecraft was not boarded until after the mid-point in the story. I'm not a patient person, so it was a difficult wait for me. Once that happened, the rest of the story blew me away. However, I did wish for a more detailed description of the aliens. I like to picture colors and textures when I read. And eyes. The eyes are the windows to the soul. Do aliens have souls? Read and find out. First off there was just so much I enjoyed. I just love the concept of an order of Religious sisters dedicated to rescuing people involved in accidents in space (Our Lady of the Rescue). An apparently dead alien starship is detected in the Kuiper Belt on an asteroid and a team has been sent out to investigate. The “Rescue Sisters” were sought out to join the mission and to provide training and oversee safety. An interesting premise, but what I think I loved most was the characters in the story. Th First off there was just so much I enjoyed. I just love the concept of an order of Religious sisters dedicated to rescuing people involved in accidents in space (Our Lady of the Rescue). An interesting premise, but what I think I loved most was the characters in the story. There is lots of tension involving competing groups and individuals with there own ideas on what first contact might bring. A clash of worldviews. Their is some depth to the characters in the story. Various levels of brokenness among the crew and the sisters. The faith of the sisters play a large part in the novel and the resolution of it. Villians in the plot are not two-dimensional characters just to provide tension and to move the plot. They have a realism to their motives and for the Rescue Sisters there is more than just physical rescuing. Sister Rita, a central character, is having to face a situation she in part ran from as someone from her past is part of the crew. There were many ways this plot point could have gone cliche, but didn’t. The character of Sister Ann was quite memorable. She had a way of speaking in non-linear way of expressing the spiritual dimension of things. Perceptive and wise, but also having her own problems to resolve. Add to this the discovery of something on the alien ship that throws the crew into conflict. As a SF novel I thought the story was quite good on it’s own merit. How character-driven this novel was enhanced the story. I have read several of Karina Fabian’s books and the majority were comic novels making the most of a fun concept. Discovery is a more serious SF novel, but her wit does poke through from time to time. I would certainly like to read more of the Rescue Sisters. It opens with a scene to set the stage: an accident at a space mining operation. Three religious sisters -- of Our Lady of Rescue -- in action. Shortly therefore, they are among the three off on a mission to the very end of the Solar System, where is a shipwreck. Of an alien ship. This was discovered only by telescope, so they are the first people out there. Miners to try recovery. Scientists to do research. Sisters to instruct in spacesuits and the like. And the ship's crew, including a zerog -- It opens with a scene to set the stage: an accident at a space mining operation. Three religious sisters -- of Our Lady of Rescue -- in action. Shortly therefore, they are among the three off on a mission to the very end of the Solar System, where is a shipwreck. Of an alien ship. This was discovered only by telescope, so they are the first people out there. Miners to try recovery. Scientists to do research. Sisters to instruct in spacesuits and the like. And the ship's crew, including a zerog -- a human genetically adapted to zero-gravity. All of them on a luxury liner that had been sent to salvage and repurposed in a real hurry to get a ship to go out there. Nuns in space? Yes, please! Okay, they're actually sisters. I do know the difference. I was hooked pretty early on in this book and found it difficult to put down again once I started. The characters are well-developed, and none feel like cardboard cutouts (including the non-Catholic ones). The idea of having a religious order in space makes perfect sense to anyone familiar with Church history, and the author makes sure there's plenty of background and history to go along with a religious order d Nuns in space? Yes, please! I was hooked pretty early on in this book and found it difficult to put down again once I started. The characters are well-developed, and none feel like cardboard cutouts (including the non-Catholic ones). The idea of having a religious order in space makes perfect sense to anyone familiar with Church history, and the author makes sure there's plenty of background and history to go along with a religious order dedicated to assisting in rescues in space. Though there are Catholics throughout the book, none of the religious discussions were stilted or out-of-place, and none of the non-Catholics were portrayed as the sorts of cardboard cutouts that tend to pop up in some Christian literature or movies. Real people with real feelings and real reasons for believing the things they believe. Discovery had me delighted from the beginning. For one thing it has nuns in space. Sit with that for a while. An order of nuns, the Rescue Sisters of St. Joseph de Cupertino, whose focus is in space. Over the years, I’ve followed quite a few of the adventures of the Sisters in space, and a few of them, like Sister Ann, have become friends I meet again. This, though, is the first full-length novel with the Rescue Sisters in it; my other brushes with them have been short stories in collections Fabia Discovery had me delighted from the beginning. For one thing it has nuns in space. Over the years, I’ve followed quite a few of the adventures of the Sisters in space, and a few of them, like Sister Ann, have become friends I meet again. This, though, is the first full-length novel with the Rescue Sisters in it; my other brushes with them have been short stories in collections Fabian has contributed to. The alien spaceship is the big pull, as high-dollar researches seek to cash in on the possibilities. The crew involved finds itself divided between the intellectuals, with the ideas and research, and the working class, who have the practical “how to get it done” knowledge. In the midst of this struggle, there’s the line between the ethical and moral boundaries that divide them in other ways. Fabian crafts worlds and stories with the same care some people take with their holiday dinners or their artisan quilts. Her characters and plot interweave to make an experience that will make you want to revisit it and reread it and share it with others. 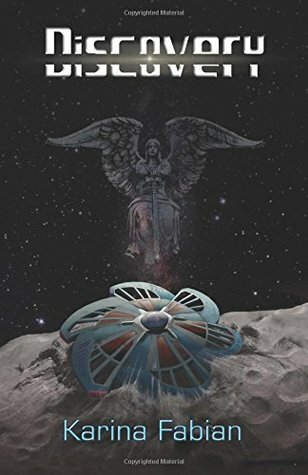 Discovery by Karina Fabian is a well-crafted science fiction about a group of researchers and scientists on a mission to learn more about a recently-discovered, crashed alien spaceship. This story has amazing depth, using facets of science and technology to illuminate spiritual realities and inner challenges of the human soul. The characters sucked me into the story from the beginning. And there are many characters, but they are all well-developed with driving goals, strong personalities, and re Discovery by Karina Fabian is a well-crafted science fiction about a group of researchers and scientists on a mission to learn more about a recently-discovered, crashed alien spaceship. This story has amazing depth, using facets of science and technology to illuminate spiritual realities and inner challenges of the human soul. The characters sucked me into the story from the beginning. And there are many characters, but they are all well-developed with driving goals, strong personalities, and realistic strengths, weaknesses and struggles. Sister Ann quickly became my favorite. This rescue sister has visions and sees apparitions of saints and Biblical figures. She also speaks in riddles that make you think. The other characters either love or hate her, though most of the time no one understands her. I found reading this story a rewarding experience. It satisfied my need for good science fiction, with imaginative concepts that seemed based on scientific theories. The character development and relationships also satisfied, especially concerning Sister Rita and James. I found myself so emotionally invested and so moved that, at one point, tears came to my eyes. But the element I loved most about this story is this: Sisters in space! How fun! God is everywhere, so why not? And to quote the book, “His mercy extends beyond time, space, or life.” I thoroughly enjoyed Discovery and can’t wait to read more science fiction by Karina Fabian. I read this book because it was recommended on a blog that's never recommended a book I didn't like. That being said, this was probably the most strange sci-fi I've ever read. The main characters were nuns working salvage out in space. Besides some of the characters obviously being strong Catholics, the faith wasn't overbearing but rather flowed naturally as did the faith of other persuasions. Surprisingly this wasn't a story that could've taken place on earth or a repeat of a plot we've all heard of read but in a different setting. This was a story of a future as I'd never visualized before with quite a few twists and turns I never saw coming. Inspirational, heart warming, funny, and relevant. Oh, to live in that world. Where at least one person connects with God regularly. Out among the planets, and with a Warp drive coming, soon to be the stars. This is a must read for science fiction fans and religious scholars alike. Deeply imaginative and thought-provoking, Discovery delivers a heart-wrenching thrill that space exploration fans will not want to miss and that the more earthbound will want to discover. A great read! It started out kinda slow and confusing, but eventually I sorted out what was going on and liked the ending much more. Still not sure what those 'pod rooms' did exactly, but maybe it's OK that they were left to the imagination. I'd like to meet Sister Ann.